RED HEART® “Soft Baby Steps™”: 4 Balls 9930 Binky Print A; 2 balls 9620 Baby Green B. 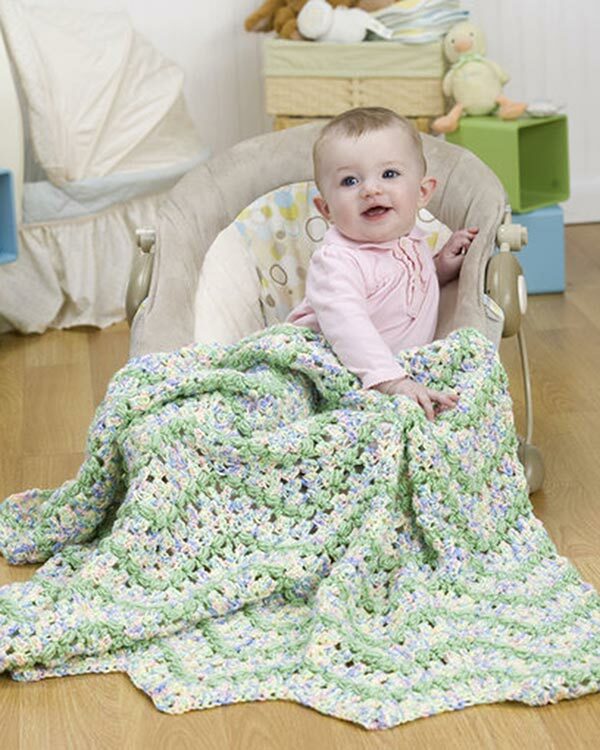 Size: Afghan measures approximately 35″ x 37″. 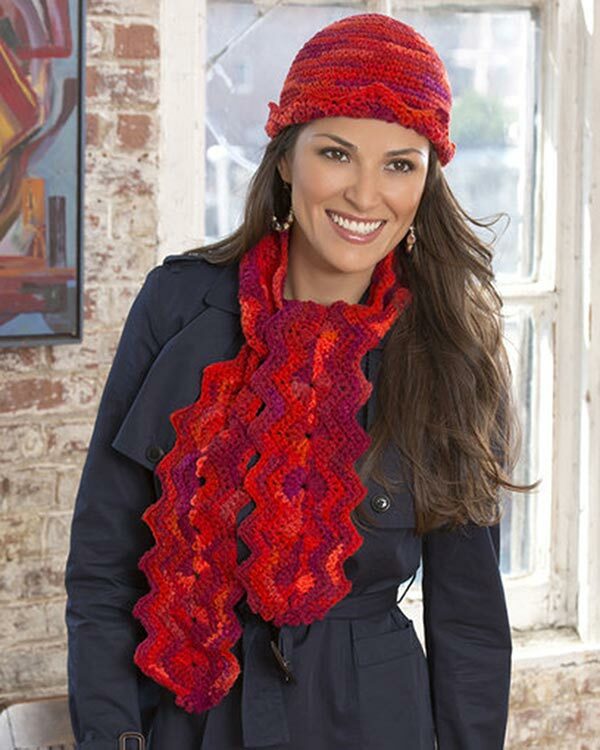 GAUGE: 1 chevron repeat = 6″; 9 rows = 4″ in pattern. CHECK YOUR GAUGE. Use any size hook to obtain the gauge. Cl (cluster) = [yarn over and draw up a loop, yarn over and draw through 2 loops] twice all in same ch or space, yarn over and draw through all 3 loops on hook. Puff st = [yarn over and draw up a loop in st indicated] 3 times, yarn over and draw through all 7 loops on hook. sc2tog = draw up a loop in next 2 sts, yarn over and draw through all 3 loops on hook. Dc in 3rd ch from hook (counts as beginning Cl), * [skip next 2 ch, 3 dc in next ch] 3 times, skip next 2 ch, (3 dc, ch 3, 3 dc) all in next ch, [skip next 2 ch, 3 dc in next ch] 3 times, skip next 2 ch, Cl in next ch **, skip next 3 ch, Cl in next ch; repeat from * across, end at **; turn – 5 wave patterns. Ch 2, dc in space between first st and next 3-dc group (counts as first Cl), * [skip next 3 dc, 3 dc in space between last 3-dc group and next 3-dc group] 3 times, (3 dc, ch 3, 3 dc) all in next ch-3 space, [skip next 3 dc, 3 dc in space between last 3-dc group and next 3-dc group] 3 times, skip next 3 dc, Cl in space between skipped 3-dc group and next Cl **, Cl in space between next Cl and next 3-dc group; repeat from * across, end at **; turn. Repeat Row 2. Fasten off. With right side facing, join B in first Cl; ch 1, * [(sc, ch 4, Puff st) all in first dc of next 3-dc group] 4 times, (sc, ch 4, Puff st) all in next ch-3 space, [(sc, ch 4, Puff st) all in first dc of next 3-dc group] 4 times **, sc2tog over next 2 Cl; repeat from * to last st, end at **; sc in last Cl. Fasten off. With right side facing, join A in first ch-4 space; ch 3, dc in same space (counts as first Cl), * [3 dc in next ch-4 space] 3 times, (3 dc, ch 3, 3 dc) all in next ch-4 space, [3 dc in next ch-4 space] 3 times **, [Cl in next ch-4 space] twice; repeat from * to last ch-4 space, end at **; Cl in last space; turn. Repeat Rows 2-5, end by working Row 3. * or ** as indicated; [ ] = work directions in brackets the number of times specified. 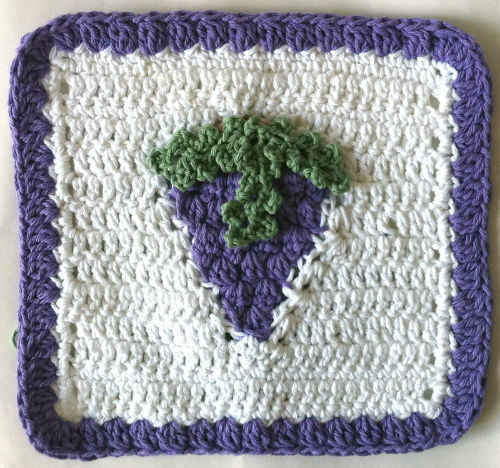 This pattern is fairly easy but when any pattern tells you to use a Cl, Puff St or any other “special” stitch, it should have a Stitch Explaination included somewhere. This pattern does not. their patterns, and I am sure that they would appreciate your feedback.